Kenyan President Uhuru Kenyatta, 53, faced five counts of crimes against humanity. 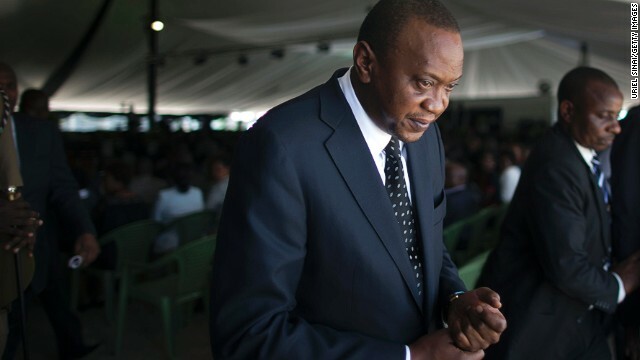 Nairobi, Kenya (CNN) -- The International Criminal Court has dropped charges against Kenyan President Uhuru Kenyatta -- the first sitting head of state to appear before the tribunal. Kenyatta, 53, faced five counts of crimes against humanity for allegedly orchestrating violence after a disputed presidential election seven years ago. "I am very keen to run to my wife right now and tell her what is happening," he said on Twitter after the court dropped the charges Friday. "To be sincere, we are very excited." More than 1,000 people died when ethnic groups loyal to leading candidates torched homes and hacked rivals in violence that raged for months. Kenyatta, who backed then-incumbent Mwai Kibaki in that election, was accused of funding a local militia that conducted reprisal attacks. He has maintained that he is not guilty. This week, the court rejected the prosecution's request for an adjournment, giving it a week to either provide more evidence or drop the charges. In light of the court's mandate, Prosecutor Fatou Bensouda said, she was left with no choice but to withdraw the charges. "The evidence has not improved to such an extent that Mr. Kenyatta's alleged criminal responsibility can be proven beyond reasonable doubt," Bensouda said in a statement explaining her decision. Bensouda has postponed the start of the trial numerous times, and accused the Kenyan government of withholding key documents in the case against its leader. "Crucial documentary evidence regarding the 2007-2008 postelection violence ... can only be found in Kenya and is only accessible to the prosecution through the assistance of the government of Kenya," she said. "This crucial assistance was ultimately not provided." The defense has rejected the accusations. Shortly after she dropped the charges, Bensouda listed a series of setbacks the prosecution faced, including the exposure and harassment of protected witnesses. The Kenyan president has denied any links to the violence, and had pledged to cooperate with the court to clear his name. "My conscience is clear, has been clear, and will remain forever clear that I am innocent of all the accusations leveled against me," Kenyatta said last month. He became the first sitting head of state to appear before the international court when he attended a status hearing last month at the court in The Hague, Netherlands. The international court has also accused Deputy President William Ruto of orchestrating attacks in the 2007 election, which he denies. His trial started in September last year. The Kenyan parliament voted this year to withdraw from ICC jurisdiction after repeatedly calling on the court to drop the two leaders' cases. But a withdrawal would take a while to implement because it involves steps such as a formal notification to the United Nations. The International Criminal Court was set up in 2002 to prosecute genocide, crimes against humanity and war crimes. The nation's previous administration reneged on a deal to set up a special tribunal to try suspects in the postelection violence, prompting the international court to step in. The African Union has urged the court to postpone cases against sitting leaders, accusing it of unfair treatment against African leaders. The international court has said it is not a substitute for domestic justice systems, and only intervenes if the national judicial system is either unwilling or unable to carry out justice. Rights groups have said the court is crucial in ensuring justice for everyone. CNN's Lillian Leposo contributed from Nairobi, and Faith Karimi wrote and reported from Atlanta. CNN's Alex Felton contributed to this report.